An iris bud slowly starts to unfold as it begins to flower at the La Source Parfumee in the village of Gourdon in France, Europe. The La Source Parfumee in Gourdon Village in France is a fascinating place to visit where a variety of different types of flowers are grown, one being the Iris. The finest essences are obtained from these flowers where they are treated and used to make perfumes with amazing scents. After an iris blossoms it is one of the most showy flowers and you can find them in a wide assortment of colors. The inflorescences are fan shaped and contain one or more six-lobed fragrant flowers and hundreds of different species of the iris flower are found worldwide. The iris that is grown at La Source Parfumee in France, Europe is used for perfume but other sources use them for medicine and essential oils. in the Provence, France in Europe. ... There is a special scent that surrounds La Source Parfumee that makes your nose tingle when you enter this fascinating place in Gourdon, France. 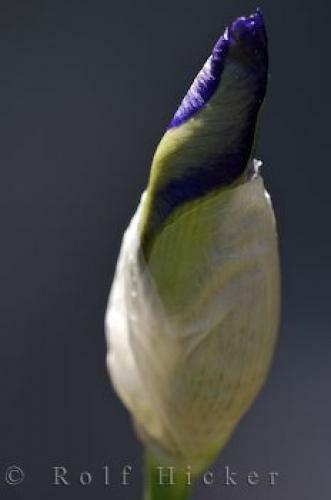 An Iris bud at La Source Parfumee Gardens, Alpes Maritimes, Provence, France, Europe. I photographed this photo with the digital SLR camera model Canon EOS-1Ds Mark II, aperture of f/8.0, exposure time of 1/125 sec. on ISO 200, as always I used a original Canon Lens, the focus lenght for this picture was 180mm.